In only 48 hours, 20 Elks scholars came together and made friendships with one another that will last a lifetime. The second annual Most Valuable Student Leadership Weekend was one no one will soon forget. The weekend began on Friday, April 24, when 20 strangers from across the country landed in Chicago. After a few games of Apples to Apples and a trip to Portillo’s for a Chicago-style hot dog, friendships formed fast. 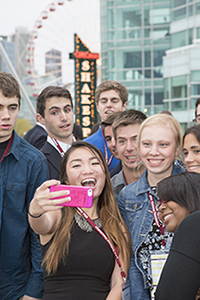 While these top 20 Most Valuable Student finalists were in town to interview for the top awards of $50,000, $40,000 and $30,000, the weekend became so much more. From a scavenger hunt at the Elks Veterans Memorial Building, to team trivia, to serving at the Jesse Brown VA Medical Center, these scholars bonded all throughout the weekend. The weekend culminated with a gorgeous dinner cruise on Lake Michigan where the new best friends danced the night away, happy to be a part of the Elks family. In the end, Sarah Jiudice, sponsored by Southampton, N.Y, Lodge No. 1574, and Mark Ansell, sponsored by Sunland-Tujunga, Calif., Lodge No. 2098, became the top scholarship winners after their interviews with the national judges, and each will receive a $50,000 scholarship. Mark will stick close to home and attend University of California-Berkeley, where he will pursue his passion for sustainable technologies and engineering. “It’s a special feeling to know someone believes in you,” says Mark. Sarah will be heading across the country to the West Coast, where she plans to attend the University of California–Los Angeles to study physical therapy. “Receiving the Elks scholarship means a future for me,” says Sarah. All top 20 MVS finalists will receive scholarships of at least $20,000, helping them secure a bright future. We know as these scholars head off to college this fall, they will take with them the support of their new Elks family and memories of the Leadership Weekend that will last forever. “I'm still amazed at how quickly we all—from different parts of the country and every facet of life—could come together to learn, laugh and serve with each other,” says Jessica Carter, sponsored by Elgin, Ill., Lodge No. 737. Want to see more? Click here to see all of the photos from the 2015 MVS Leadership Weekend. 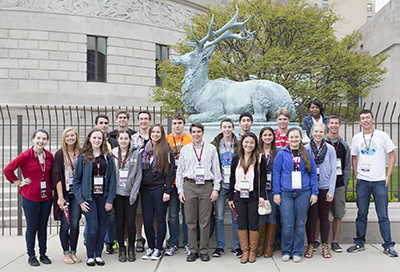 For 2015-16, the Elks National Foundation allocated $2.74 million to fund the Most Valuable Student scholarship program, which includes 500 four-year Most Valuable Student Scholarships. For more information about the Most Valuable Student scholarship program, including eligibility and deadlines, visit www.elks.org/enf/scholars.